Watching my daughter play basketball can be an excruciating experience and an uplifting experience at the same time, but that exploration is a personal reflection for another time! Being a spectator of junior sport has also meant I can watch coaching from afar. 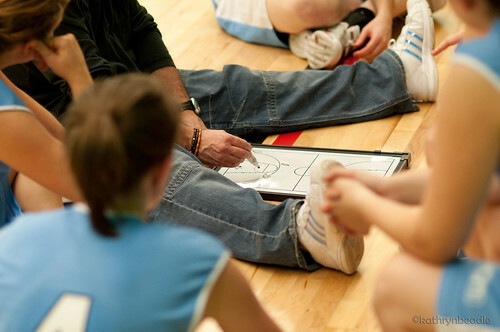 Not “being” the coach nor the player has enabled me to set a wider gaze on the team and individual improvement process. To see how the players coach each other and how the coach guides to work towards results. Having been the player and the coach and rarely the spectator has meant I have missed a whole other aspect of coaching for improvement. Watching my daughters games has allowed me to see how umpires/referees are also coached for improvement in real time. As I sat in the stands I watched as a mentor spoke to the two court referees during a time-out. There was a lot of discussion and pointing to parts of the court. This was for all intensive purposes JIT (just-in-time) teaching. Sport is such an open learning space. The players are being watched, the coach is being watched and of course the umpires/referees are being watched. It springs to mind that when you have an audience and opportunity for “coaching” and feedback your development is continually the focus. For teachers though, much of our practice is in isolation, never to be coached in real time, by our mentors or our teammates. If we don’t deliberately construct spaces and opportunities, then we make it the more difficult to keep improvement at the focus.